Lionel Messi showed in the last game against Osasuna why he is considered the best footballer in the world, on and off the field. Earlier this year, the Barcelona ace met Soufian, a 10-year-old Moroccan boy, who has Laurin Sandrow syndrome, a rare medical condition that can eventually lead to the loss of the lower extremities. Set with artificial legs, he hadn't lost his passion for football. And he feverishly followed Messi's performances with Barcelona. The boy is such a Messi fan that he has his artificial legs painted with the Barça colours and an inscription of Messi's number ten. When Messi met the boy again last Friday, he promised that his first goal would be dedicated to him. And the Argentine star kept his promise. 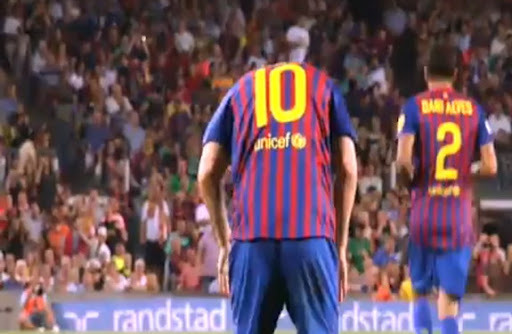 After scoring his first goal of an eventual hat-trick in an 8-0 rout, Messi produced his special celebration for Soufian. Whilst Messi usually points to the sky after scoring a goal, the 24-year-old slapped his thighs. It was a characteristic gesture of generosity by the most uncharacteristic, and talented, of all footballers.